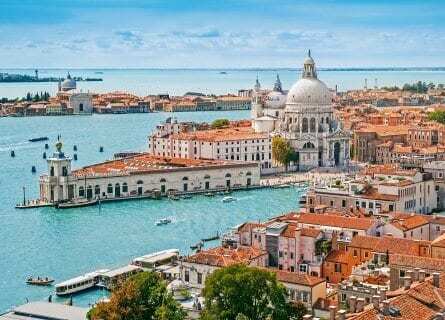 Venice is quite possibly the most romantic place in the world and the ultimate destination for food and wine lovers seeking to combine culture to their trip! With its colorful Gothic palaces and interconnecting bridges and canals, it is unlike any other city on earth. The surrounding Veneto region is also stunning with verdant vineyards, Palladian villas, Cistercian Abbeys, flower-covered mountain pastures, villa-lined rivers, castles, and historic villages. With your own private driver and elegant Mercedes, you will visit some of Italy’s loveliest towns from Venice itself to Verona, Padua, and Vicenza; captivating villages like Bassano del Grappa and tiny wine country hamlets. Your tour begins in Venice, en route to Asolo, a medieval walled hamlet with a magical atmosphere. Your hotel is in a dreamy setting and also a celebrity magnet (celebrities and royalty from Orson Welles, Catherine Deneuve, and Peter O’ Toole to Prince Philip of Edinburgh have stayed here). Over the next few days you will visit quaint little towns like Maròstica (home to a medieval human chess tournament), taste Grappa in its birthplace, go on a wine tour of Prosecco and visit the refined art city of Padua (where Giotto’s masterpiece Scrovigni Chapel is located). The Ancient Roman town of Verona and western Veneto are next. You can look forward to wine tasting tours of the Valpolicella and Trento, a scenic boat tour of Lake Garda, and sightseeing in Vicenza, just to begin. Your charming hotel in Verona is a tiny palazzo furnished exquisitely with period furniture (think Persian carpets, silver candlesticks, antique chandeliers, and valuable china). 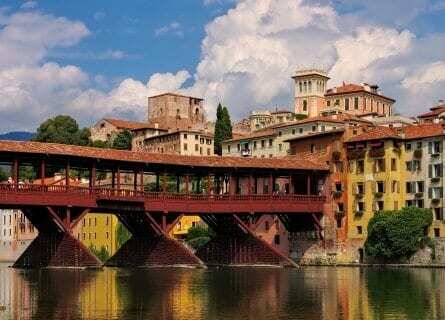 You will discover Verona with your own private art guide and visit the Roman Arena (which holds a wonderful outdoor opera season each summer), among other famous sites such as Romeo and Juliet’s Balcony. Your last few days then will be based in Venice. Here you can take part in some great activities designed for you like a private cooking class and market tour with your personal chef and a sunset gondola ride, but you will also have plenty of free time to discover Venice by yourself. Find your own secret corners and piazzas in Venice, with our suggestions on wonderful wine bars and restaurants. Your exclusive hotel is on its own island away from the chaotic tourist crowds, and you will have the hotel’s VIP boat at your service to nip over to Saint Mark’s in just a few minutes glamorous boat ride. Food and wine are always a major focus on our tours, and the wine estates you visit are superb, ranging from boutique and family-run to bigger prestigious cellars. Traditional dishes in the Veneto you might try on this tour include Fiori di Zucchini (zucchini flowers) stuffed with a creamy fish sauce and lightly battered, Risi e Bisi (delicious risotto made with fresh shelled peas and bacon), Zuppa di Cozze (mussels cooked in white wine, garlic and parsley), and Radicchio Alla Griglia (grilled red endives, from Treviso). For dessert, you will likely taste freshly-made Tiramisù and some fabulous Italian cheeses such as Asiago and Montasio. Simply delicious. A mix of informal trattorias, up-market traditional venues, and luxurious Michelin starred eateries are all in store. This tour in the Veneto is designed for food and wine lovers looking for luxury and La Dolce Vita. If this sounds like what you are looking for, contact us for more information. Arrive at Venice airport, and your private driver guide and comfortable Mercedes will be waiting for you. 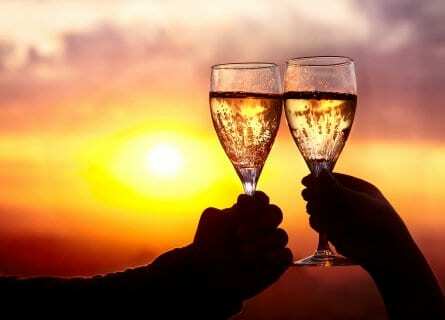 Today you will head for the winelands to taste some of the best examples of Prosecco Superiore di Cartizze. The Prosecco wine country is characterized by its rolling hills, ancient abbeys, and medieval churches. 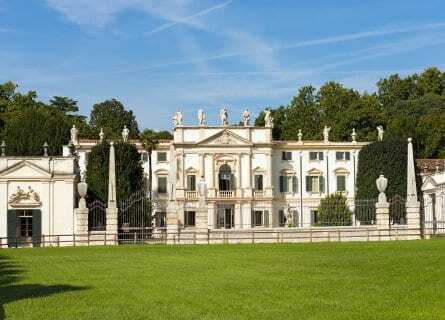 You will begin your Prosecco tour at one of the most spectacular wineries in the appellation like Villa Sandi with its 17th-century mansion and one million legends. There are over 1600 meters of atmospheric brick-vaulted cellars, and you will receive a private tour followed by a tasting of their top Proseccos and still wines like the sparkling Opera Trevigiane and the red Riserva Marinali. A convivial lunch awaits at the winery’s romantic Locanda. On to Asolo, your base for the next few nights. Asolo has long been the muse for poets and writers, and there is even a pretty street dedicated to Robert Browning (a 19th century English poet) who wrote “Asolando”. Settle into your luxurious villa-style hotel (once owned by Browning) and enjoy a free evening. Check out the medieval cathedral, with its historic paintings by Lorenzo Lotto and the Palazzo della Ragione with its 16th-century frescoes by Contarini. Visit the Queen Cornaro Castle (a Venetian noble who during the Renaissance brought the court here to Asolo) and the 13th century San Gottardo church. Dinner at the hotel’s restaurant is highly recommended. Welcome to the Veneto! Today is focused on sightseeing and grappa! Your driver will lead you through the cypress-clad hills around Asolo to the peaceful little hamlet of Bassano del Grappa. Bassano is extremely photogenic so don’t forget the camera! The 16th century Ponte Vecchio (designed by Palladio) is gorgeous. Spend some free time exploring Bassano on your own. You can visit the Museo Degli Alpini if you are interested to learn about the role Bassano had in the first and second world wars. Pick up some high-quality Majolica at one of the colorful ceramic shops. Take photos of the sparkling Brent River with the town in the backdrop. Lunch is at a local, authentic trattoria and you might try carpaccio or risotto as an appetizer and some fresh fish washed down with delicate local wines. After lunch, rather than having a grappa digestif, you will actually visit a Grappa distillery as Bassano del Grappa, is (as per the namesake) famous for its grappas. On a private tour, visit an artisan distillery dating back to 1898, and learn all about the Grappa making process (the word actually comes from “Graspa” which means wine lees). After your grappa tasting, head next to Maròstica, a fortified medieval hamlet. Maròstica is world famous for its real-life chess tournament. Every other September, the main square comes alive with people dressed as the queen, knights, and pawns re-enacting this human chess game (called the Partita a Scacchi) that has been celebrated since the 15th century. In the late afternoon, transfer back to your luxurious hotel and relax. Free evening. This morning, you will travel south to Padua (Padova), an elegant city famous for the artistic legacy Giotto left here. You will discover this undiscovered town on a private guided walking tour with an art guide. Take in the Basilica of Saint Anthony, the Scrovegni Chapel (with Giotto’s celebrated masterpiece, painted in 1303 and still perfectly conserved) and the majestic Prato Delle Valle square. Enjoy some free time after your art tour in Padua. Have a coffee at the historic Caffè Pedrocchi. Padua is a university town (indeed with one of Europe’s oldest universities which you can also visit) and as such, you will find many bars and outdoor cafes brimming with students. Lunch today will be gourmet in an elegant spot, and you will taste the best wines from the nearby Colli Euganei appellation. And after lunch, you will visit this beautiful and unspoiled wine region. Most of the wine country here is actually located inside a protected national park and the scenery is fabulous. The 12th-century castle with elegant gardens and a working winery are on the program now, and you will have a VP private tour and tasting of estate wines. 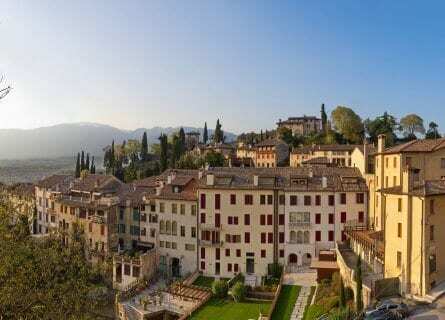 In the early evening, you will return to Asolo for your last night here. After a full breakfast and those million dollar views, check out of the hotel as today you will be moving on to Verona. But first, a visit to Vicenza. Vicenza is known as the “City of Palladio”, referring of course to Andrea Palladio whose perfect geometric designed villas such as La Rotunda (which you will see, located outside of Vicenza’s historic Centro Storico) was the inspiration for the White House. You will discover some of Vicenza’s gems with your own private art guide on a two-hour walking tour. Visit the Santa Corona church to glimpse Bellini and Veronese’s famed paintings and the Piazza dei Signori with the sublime Basilica (designed by Palladio). An excellent lunch will follow with regional cuisine presented elegantly. After lunch, you can visit a wine estate if you like or head straight to Verona to relax. Arrive at your atmospheric hotel in Verona’s historic center, check in and relax. You will have a bottle of bubbly waiting for you to enjoy at your leisure. The evening is yours to enjoy Verona; we recommend the Bottega del Vino wine bar and restaurant, very cozy and cute. Today you will enjoy a VIP wine tasting tour of the Valpolicella, home to the unique Amarone wines. Begin with a visit to one of Valpolicella’s “Chateaux” such as Allegrini or Villa Novare. Explore the manicured gardens, beautiful grounds, barrel cellars and conclude with a tasting of flagship wines. Lunch is next in a beautiful small trattoria with a fabulous pergola terrace (with views of Lake Garda and the surrounding vineyard covered hills). If visiting in colder weather, inside is very cozy with a fireplace and stone vaulted ceiling. After lunch, we have a major treat- a visit to Villa Monteleone, a small and exclusive estate owned by the glamorous Lucia Raimondi and located in the heart of the Valpolicella Classica. Taste their best Amarones including Campo Santa Lena, Campo San Vito, and Villa Monteleone- all made with Rondinella, Corvina and Molinara grapes harvested from 20-30-year-old vines. You will also taste one of their delicious Recioto wines. In the late afternoon, carry on to Verona for a free evening. 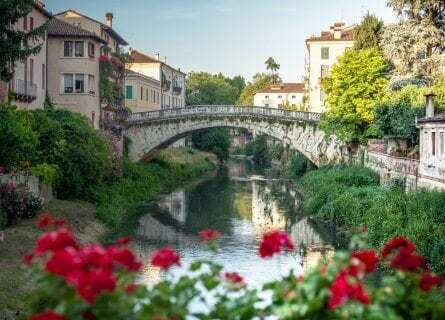 This morning, your private art guide will lead you on a guided walking tour of Verona to include the Ancient Roman sites (the spectacular Arena, Ponte Pietra, Porta dei Leoni and Arco dei Gavi, etc) as well as other beautiful sites from royal gardens, the cathedral (with its Romanesque art) to the house where Shakespeare’s Juliet (Romeo & Juliet) is said to have lived, including her balcony where she might have uttered her “where art thous”. After an invigorating morning walk, your driver will take you to lake Garda, where a fantastic lunch awaits you at one of our favorite places like La Speranzina, you will love this! After lunch, you will explore the vast Garda Lake by your private motor launch. 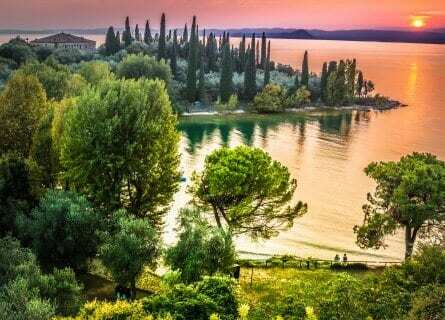 The Garda lake circles around the provinces of Verona, Trento and Brescia and the Verona side is known as the “Riviera degli Olive” (Olive oil Riviera). Lined with colorful fishing villages, castles and walled towns, and luxurious villas recalling the Grand Tour, this is a beautiful part of the Veneto. From your boat, you will pass these lovely towns and villas, bring the camera to get some great landscape photos. Tonight you will have an elegant dinner arranged for you in Verona’s best restaurant, located in the 16th century outrageously romantic Palazzo. A gorgeous winery owned by a Marquis and the little-explored city of Trento is on the program today. Your driver will take you north towards the town of Avio where you be welcomed by an aristocratic winemaking family. This estate is outstanding, and the setting is stunning with steep limestone mountains in the backdrop of the lush vineyards, and the pastel-colored villa. Tour the property and finish with a wine tasting, of course, tasting the winery’s three awarded wines. Lunch is up next! This region’s gastronomy is based on both the Venetian “Tridentina” as well as the German “Altoatesina”. You will taste local specialties like smoked Speck, Polenta with funghi (mushrooms), and perhaps finish off with a traditional Trentino “strudel”! Apples are a traditional product in this Italian region and will be extra fresh. After lunch, you will visit Trento town. Known as Tridentum by the Ancient Romans, Trento has been inhabited and ruled by Romans, Goths, Lombards before being annexed to the Holy Roman Empire. These days, it is a quiet, cultured town that aesthetically resembles Austria more than Italy. You will have free time and we suggest you begin your stroll of Trento at the Piazza del Duomo with its Romanesque Duomo and 13th century Palazzo Pretorio. Check out the Regional art museum, located inside a castle. Enjoy a digestif or coffee at one of the many cafes. Evening arrival to Verona and dinner on your own. And finally, today, Bella Venezia awaits! Transfer to Venice by Mercedes and then upon arrival at Piazzale Roma, your own VIP water taxi will be waiting for you, to take you along the Grand Canal to your luxurious island hotel. Check-in and relax. Once you feel like exploring Venice, take into account the town is divided into six quarters, all very close walking distance to each other- San Marco (Saint Marks and the Doge´s Palace, and just across the water from your hotel), San Polo (“real” Venetian quarter, not as touristy), Cannaregio (where the famous Ghetto is located), Dorsoduro (university area and some trendy bars), Castello (which hosts the world-famous Biennale Arts Festival); and Santa Croce (near the Santa Lucia train station). Enjoy lunch on your own with our suggestions. In the late afternoon, you will explore the “best of Venice” with your own expert art guide who knows all the narrow alleyways, picturesque bridges and secret corners of Venice. Based on your interests (museums, shopping, legends of Venice, etc) we will customize the tour just for you. There is an awful lot to see and do in this amazing town. Dinner is on your own with our suggestions. This morning you be collected from your hotel by your own chef and after crossing the canal to Saint Mark’s, will have a walk to the Rialto market, one of the most colorful in Italy. Market Tour. From the market, you will carry on to a beautiful private palazzo for your cooking lesson. A fantastic cooking class is to follow, with all fresh, local ingredients. After the class, you will sit down at the table and enjoy the meal with your hosts. This is an extremely special way to discover the essence of Venice and its gastronomy, with two of its most charming locals. The rest of the day is at leisure. At sunset, your own Gondolier will arrive at your hotel and sweep you away for a beautiful gondola ride. You will then enjoy a farewell dinner at one of Venice’s mythical Michelin starred gems. A sample dinner would be Tartare e mousse di tonno (Tuna Mousse and Tartar), Capesante gratinate al timo (Gratined Scallops), Assaggio di Granceola con salsa di corallo (Amuse Bouche of Crab), Risotto con scampi ed erbe spontanee (Scampi Risotto), Filetto di branzino all’aceto balsamico (Mediterranean Sea Bass with Balsamic reduction) all paired with a white wine from the Soave Classico appellation such as the Pieropan estate. Tantalizing, creative Venetian cuisine! This morning your private water taxi will pick you up at the hotel to take you to the mainland where you will be transferred by Mercedes to Venice airport. Drop off at airport and end of services. And this concludes your unforgettable trip to Venice and the Veneto. Hope you had the time of your life!